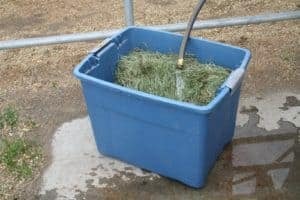 When soaking hay it must be completely submerged, and it should be fed quickly after soaking so it does not mold. Q: My veterinarian just diagnosed my mare with insulin resistance and recommended I soak her hay because I haven’t had it tested. I’ve been doing some research and I’m wondering whether I could steam it instead? A: Horses with insulin resistance need to consume diets with low nonstructural carbohydrate (NSC, the sum of the starch and water-soluble carbohydrates [WSC] in the diet) levels. Generally, nutritionists and veterinarians recommend that the diet should contain less than 12% NSC on a dry matter basis. Since the majority of a horse’s diet should be forage, it is important to consider the forage’s NSC content. There is no point in carefully feeding a low-NSC commercial fortified feed if the horse’s forage is high in sugar. Ideally, you would test the hay so you know for certain what you’re dealing with and how suitable the hay actually is. If testing shows that the hay does, in fact, have a NSC concentration of less than 12% on a dry matter basis, then you could feed it with no further action. However, testing likely isn’t feasible if your hay changes frequently as is the case in some large boarding facilities or for those with limited storage. When soaking hay it must be completely submerged, and it should be fed quickly after soaking so it does not mold. Research has shown that soaking hay in hot water for 30 minutes or in cold water for 60 minutes does reduce the WSC level. The amount of WSC leached from soaking varies from hay to hay and, while it will certainly lower the NSC, there is no guarantee that it will reduce it to a safe level. Of course, the only way to know for sure is to test the hay after it has been soaked. Steaming, on the other hand, involves placing hay in a chamber through which steam passes. Commercially available steamers are safe and proven to create repeatable results. Hay is steamed for about an hour and the temperature should be held above 80°C (176°F) for at least 10 minutes before the hay is removed. While it is possible to create a homemade steamer it is very unlikely that one can generate the temperatures necessary to have a positive impact on the hay; in fact, not reaching high enough temperatures while steaming can actually lead to bacterial growth. Research has shown that hay steaming improves palatability and significantly reduces mold spores and dust. 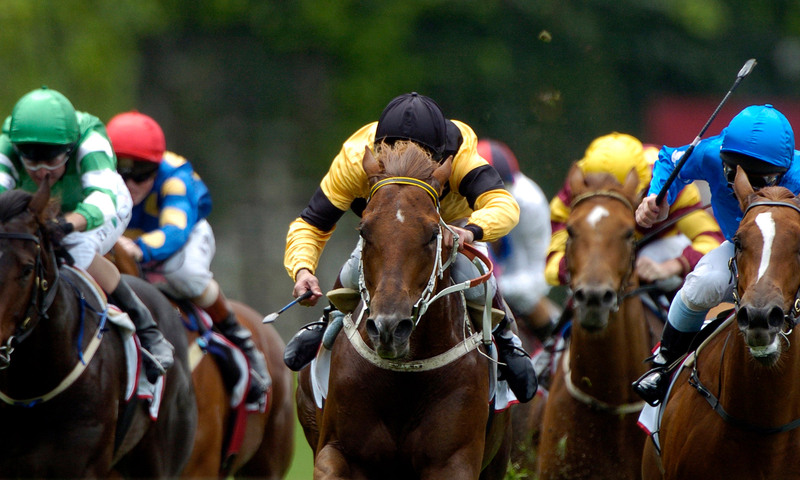 In fact, steaming using a commercial device decreased the risk of horses developing inflammatory airway disease 63%. To your question, studies have shown that steaming does cause a small, but significant, WSC content decrease. In a hay with a starting WSC of 12.6%, steaming for 50 minutes decreased WSC to 10.3%. Should the hay have had an initial WSC that was much higher, steaming might not have reduced the WSC content to within appropriate levels. However, this is a risk with soaking, too. The only nutrient steaming removes from hay is WSC, whereas soaking can leach other valuable nutrients such as protein, some minerals, and overall dry matter. And, after soaking you are left with a large amount of water that’s contaminated with the leached nutrients and requires careful disposal. The water should not be released anywhere that it could contaminate waterways. Given the convenience of steaming over soaking, the former is certainly an attractive option even though it might not lower the WSC as much as soaking. I would recommend that, if possible, you test your hay. If it already has low WSC then neither treatment is necessary. If you only need to reduce the WSC slightly I would be inclined to choose steaming. However, if WSCs need to be reduced more than a couple of percentage points, I would likely go with soaking.